LifeWay Research just released a few findings from a new study that discovered 69% of American parents (churched AND unchurched) would encourage their children to attend VBS if they were invited by a friend. Let that sink in a minute—IF they were INVITED. All it takes is an invitation? Wow, that’s easy! What are we waiting for? Let’s get started! Here are some quick tips to harness the power of a simple invitation. An invitation from a friend will obviously be better received than an invitation from a stranger. So encourage families in your congregation to invite their friends to come with them to VBS. A church-wide challenge to “Each One, Invite One” to VBS may be a good way to keep the goal in front of the congregation in the weeks leading up to VBS. Provide cards with the dates & times of VBS for church members to take so that they are armed with a reminder and the information needed to extend an invitation. Plan a community block party or a pre-VBS kick off event with the goal of building relationships with families in your community. Recruit people who are naturally outgoing and friendly to help families connect with one another during the event. Personal invitations mean so much more once you’ve taken the time to actually get know a family! An invitation is a beautifully simple thing. A short, handwritten note, a warm smile, a quick phone call is all it takes. There’s nothing time-consuming or intimidating about it. 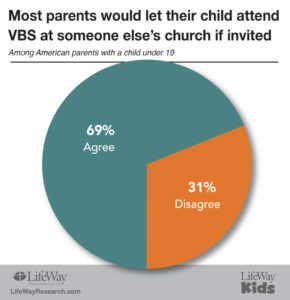 And according to the aforementioned research study, parents from all kinds of backgrounds and religious persuasions are generally open to their kids attending VBS if invited by a friend. Facebook posts, text messages, and emails may be convenient, but they’re a poor substitute for face-to-face conversation. Get in the habit of making eye contact with the people you meet, asking questions to help you get to know them better, and issuing them an invitation to join your family at VBS. As you get to know parent, look for obvious ways for them to plug in to VBS at the same time as their children. Not all parents want to (or can) be involved, but there are some who would love the opportunity to share their gifts and talents. Others might be hesitant to let their child attend without them. No problem! There are plenty of ways to be involved. Do they enjoy taking pictures? Tell them you’ve been looking for a VBS photographer. Are they crafty? Invite them to help in the craft rotation. Plugging parents in gives them an opportunity to develop relationships with other adults and gives them the chance to see firsthand what’s going on at VBS. The reason you want kids to come to your VBS isn’t to grow your numbers. VBS is still worth doing even if only a few kids attend. The reason you want kids there is because the message of the gospel is too important for them to miss out on. Jesus commanded us to go into all the world and preach the gospel. One of the ways we do that is through VBS. Parents might allow their kids to attend thinking it’ll be a few hours of fun, songs, and games, or maybe they think it’ll help their children become a better person. But the reality is, God will be at work in your VBS. And the person you invite may just have his or her life changed—for eternity! If the message is so important and people will come if we only invite them, how can we possibly not invite them? For more information on the research study, click HERE.